The reservoirs made by damming a small brook or stream which then floods the surrounding valley are a joy to anglers because they are so scenic. 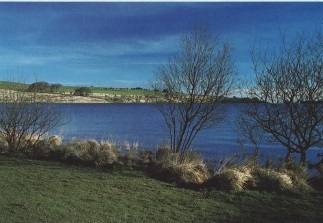 The other type of reservoir is completely man made and has sloping concrete banks. While these are nowhere near as attractive to look at as the 'natural' flooded-valleytype, the fishing in them can be just as good. At first you may think that there is no real way of locating the fish in a big reservoir in winter. Though it seems that all you can do is 'chuck-it-and-chance-it', this is far from the case. The fish-finding features on a reservoir are not as obvious as on some other waters. There are no islands or bars just visible below the surface and most weed beds have died off come winter (if, in fact, there were any there in the summer). The only visible features are the dam wall and valve tower - both of which can provide excellent sport in winter. From the dam wall you can reach the deep water easily. A lot offish gather here in winter, attracted by food particles trapped in the deep water at the bottom of the wall. The valve tower provides fish with both protection and food. Coarse fish find plenty to eat among the algae growing around the base and up the sides of the tower- and the algae shelter lots of insects, on which roach and bream feed. 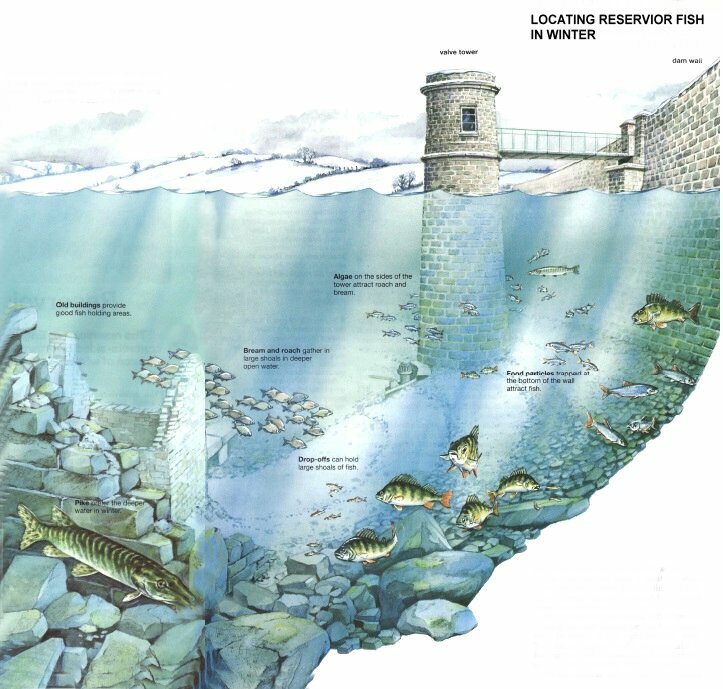 The protection of the valve tower also attracts a host of small fish and fry in winter and these, in turn, draw the two prime predators- pike and perch. If you get permission to take a boat out on to the reservoir, then an echo-sounder can be an invaluable piece of equipment. Look for contours on the bottom, such as troughs and ledges, or for the course of the old stream bed. All can hold fish. Sudden drops-offs are among the best areas to locate shoals of coarse fish. A carefully positioned bait at the bottom of a drop off can be most productive. During the colder winter months beware of fishing the shallows. When the weather is really cold the shallows on the reservoir are almost completely devoid of fish, so there is little point in wasting time fishing these areas. 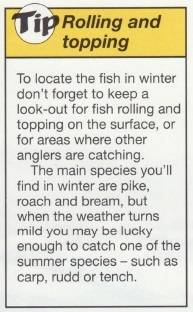 To quote an old saying "You can't catch the fish if they are not there" - although if there is a sudden mild spell the fish may move back into some of the shallower areas around the still water. The weather can have a great influence on where you're most likely to find the fish. The different species respond to different weather conditions in winter. As in summer, most coarse fish follow the wind. If you are fishing for roach or bream don't be afraid to fish right into the wind. 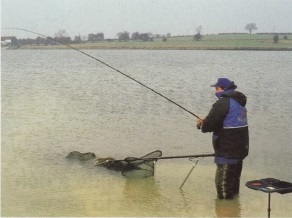 Too many anglers make the mistake of fishing the most sheltered and comfortable swims- only to end up with a dry net! All fish seem to respond well to a sudden rise in temperature. If it has been cold for a length of time, then a sudden mild spell, when the higher temperature brings most fish on to the feed, is the best time to fish. A sudden cold snap has just the opposite effect - putting most of the fish off the feed until the temperature has stabilized after a few days. The main species in reservoirs are pike, perch, roach and bream. Pike - This fish is probably the most obliging feeder of them all. It feeds right through the winter in all types of weather and conditions, from the mild October winds to the frost and snow in the heart of winter -although sport does become slower as the weather turns colder. In the winter pike prefer the deeper water, with the dam and valve tower being hotspots. And where you can find shoals of small fish or fry, the pike will not be far away. All standard methods can catch pike on reservoirs, with either livebaits or deadbaits being the most successful. A drift float can come in useful for reaching those areas, such as sudden drop-offs, which are out of casting reach. Perch - Like the pike, you can find the perch wherever there are fry, but they also like snaggy areas such as the valve tower or sunken buildings and walls where there isthe chance of some shelter. Best baits for perch are lobworms, small livebaits or deadbaits or spinners. Do not fish for perch during the really cold months. The best times are October until early December, before the hard frosts start to set in, and February and March when the weather turns milder towards the end of the season. Bream and roach - These two species have very similar habits during the winter. Both swim around in big shoals in the deeper open water or by the dam wall. The bream also like to patrol along the course of the old stream bed. Neither species likes the temperature too cold. The best conditions are rough and windy weather when the water has coloured up after heavy rain. Lobworms, bread and maggots are the best baits for bream and roach. Ideally these baits should be fished at first light and in the evening up to a few hours after dark (if allowed).